IUPAC announces a transnational/transcontinental call for proposals in polymer chemistry supported by a consortium of funding agencies. 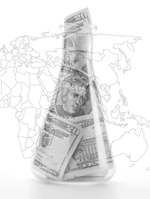 The goal of this first pilot call is to establish an efficient transnational funding program in chemistry, transcending national boundaries, with minimal bureaucracy. This call is intended to foster trinational cooperation in polymer chemistry and encourages involvement of researchers from developing countries. All researchers working in this field and eligible to apply for financial support from their participating national research councils are cordially invited to apply. This program is designed for interested research teams involving three principal investigators, each working in a different country. Each team will submit one joint proposal. Letters of intent are due 15 November 2009. For the eligible projects, the full proposals are due 15 February 2010. The final results of this call will be conveyed to applicants by 15 September 2010. The funding of all successful proposals will start no later than January 2011.
or email <proposal@iupac.org> for more details. Page last modified 18 September 2009.